The forest fairies are once again in need of help! Dispel the ancient curse by harnessing the magical properties of numbers and logic! Free animals and other mystical creatures from the dark forces that hold them as you complete challenging logic puzzles! 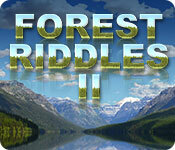 Forest Riddles 2 is rated 2.8 out of 5 by 14. Rated 5 out of 5 by lininindy from BEST OF ALL!! Superb graphics. Refreshingly new ?objects?. I loved the music. I LOVE the high def pictures. THIS griddler is easily my NEW FAVORITE. I really don't agree with the other ratings. Rated 4 out of 5 by margot01 from Beautiful backgrounds I would have rated 5 stars if all the levels were monochrone. 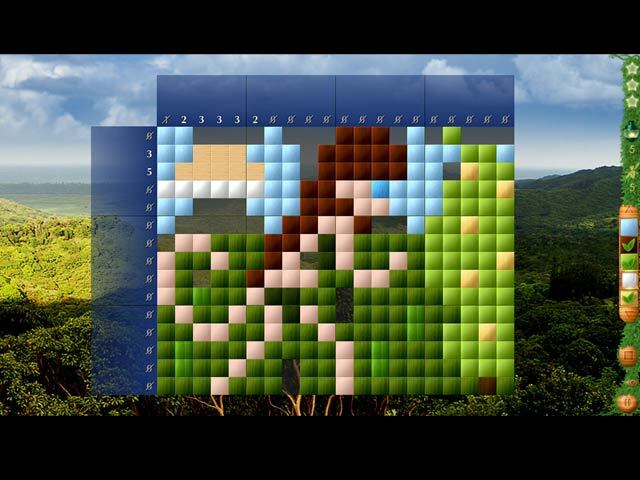 The coloured nonograms or picross games are way too easy to my taste. Also sometimes it was hard to seperate the tile colour from the background. The backgrounds in this and the previous forrest riddles game are beatiful and relaxing. Rated 4 out of 5 by MrsBen from FOREST RIDDLES 2 HAS GREAT MUSIC AND GOOD GAME PLAY! I love listening to the good music as I solve the puzzles. Most of the colors are nice and bright, but a couple of the darker ones were harder to differentiate between. The pictures are nice and the entire atmosphere is great, due to the music. There is a challenge enough to keep you interested and I like that. I do prefer colors with more depth and definition...these are just flat, but I enjoy playing the game and that's what it's all about. Give it a try. I've learned to give ALL the games a try, because one that I may not think looks promising, turns out to be a very enjoyable game! Hope all you little fishes are healthy and happy!! Rated 3 out of 5 by dgeehring from Almost! I usually buy the Fantasy Mosaics without even demo and I almost did it with this game because it looked like the same quality. But, I decided I better try the demo and glad I did. This has so many elements to make it a great game of this genre, but alas, it has a fatal flaw - you can't see the numbers well. Even worse, you can't tell if something has been filled in or not on many of the squares because they use very dark colors and black a lot and the background, which never changes, is a very dark green. That's why I gave the challenge level a 3, because too much of the challenge was seeing the colors vs. solving the puzzle. If they fix that they have a winner that I would buy. Rated 3 out of 5 by mms1 from Tough on the eyes for color differentiation Not a bad game - colors impossible to tell the difference between. Switch colors to the more distinctive ones then fill in the rest. Does not stick totally with the five grid squares - need to count. Rated 3 out of 5 by matouks from why? Firstly, for me mosaics are a dream come true and this one has good colours and somewhat challenging. Now to the why...why do designers still put picture backgrounds on the puzzle square. When one is using greens or dark colours there is a blend and easy to make a dumb mistake. Either make the square a solid/bland colour or fade the background if you can't give up the picture. The highlight vertical and horizontal is too flashy altho' again it could be partly the background. I may have missed it but I didn't see an option on player deleting the squares - personally it throws me off when it a square automatically disappears (especially with the background. I like to delete/count off the squares with an automatic delete when a line is finished. Would have loved the game but I've played/own so many that I'm spoiled. See Rainbow mosaic treasure trip 2 and fantasy mosaics. Recommend with try first. Rated 2 out of 5 by arnold1049 from UNABLE TO PLAY WITHOUT A MAGNIFYING GLASS When this series came out, I was glad to have another choice in this genre. I have now purchased and played all three games in this series and I have the same complaints for all of them. The background used for the numbers above the columns and next to the rows is a dark blue that the dark colored numbers are impossible to see without a magnifying glass. 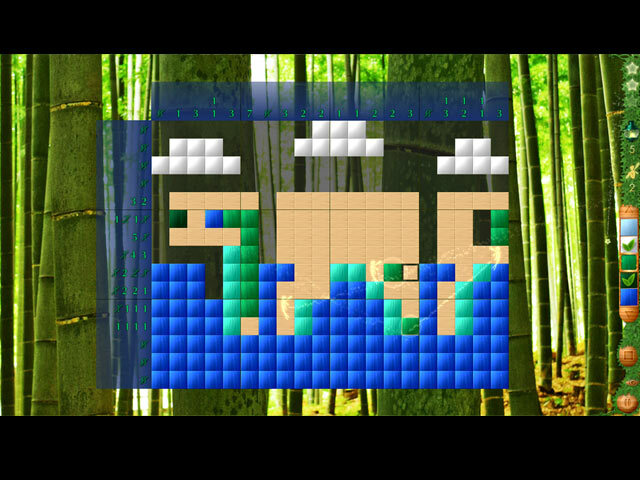 The background for the tiles is the scene itself, so, depending on what position the tiles fall on the scene, they can also be impossible to see. Additionally, the differences in the colored tiles is often so slight, (black, dark brown, even darker brown), creates another problem that makes the games extremely hard to play. I'm not sure why I continue to struggle with these games. I even purchased a better magnifying glass to help. I'm thinking that the eye strain caused by the choice of color schemes is not worth it. Rated 2 out of 5 by toniaa from Beutiful but baffling I love the pictures layouts and mechanics enough to go through the constant aggravation of numbers that are not clear enough and a background that swallows colors whole so stupid mistakes are made not because I can't count but because I can't see the difference. I can only take it about 3-4 puzzles at a time and yet find myself going back and trying it again and again. But PLEASE listen to our critism and give us a better product. Rated 2 out of 5 by chunkychow from Loved the first Forest Riddles This one, however, about put my eyes out. It was so hard to see the correct colors you had to find - glad I played before bought. Please make another one that is easier on the eyes - thanks! The forest fairies are once again in need of help! Use the magic of numbers and logic to free the captive forest creatures.